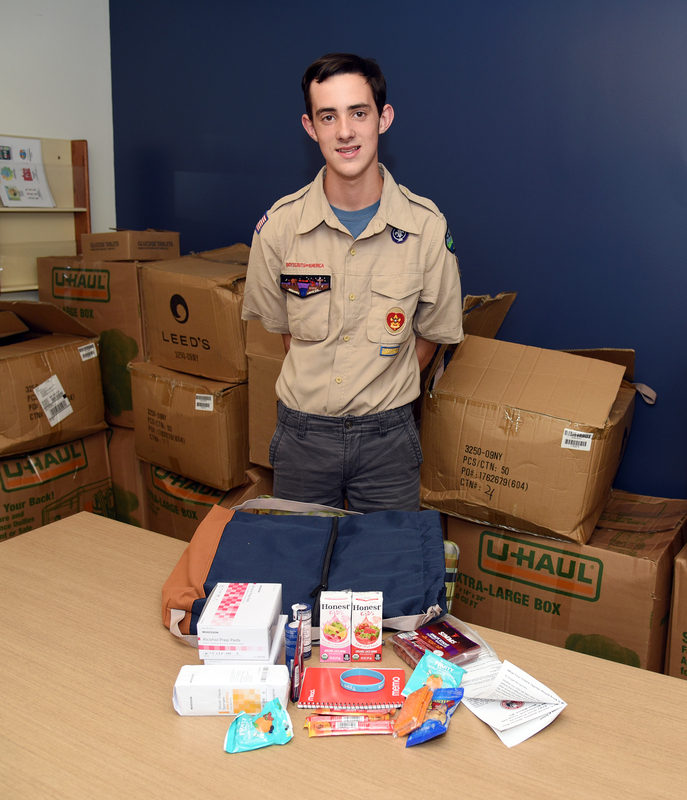 MORGANTOWN, W.Va. – Jake Shuttleworth is working his way toward the top honor among the ranks of the Boy Scouts of America while also leaving a legacy for diabetes patients at WVU Medicine. Shuttleworth, a 16-year-old junior at South Harrison High School, was diagnosed with Type I diabetes in November 2017. He’s still adjusting to the lifestyle changes that accompany the disease, but he turned a learning experience into a teaching moment. Shuttleworth raised money and assembled 250 kits for diabetes patients, which he recently donated – along with a check for $831 – to WVU Medicine’s Diabetes Education Center. The project is also part of Shuttleworth’s bid to become an Eagle Scout, the highest achievement of rank attainable in the Boy Scouts of America. The kits, aimed at school-aged patients, contain medical supplies, such as alcohol wipes, gauze pads, and glucose tablets and gel; snacks, such as fruit snacks, juice boxes, and meat sticks; a note pad and pen to monitor sugar levels; a rubber bracelet; and a personal letter from Shuttleworth. The letter details Shuttleworth’s story and lets new patients know what to expect. On the back of the letter is an informational message for students to share with teachers who may not have experience with Type I diabetes patients. Haney said the kits will be distributed to school-aged Type I diabetes in- and outpatients. The money might be used to start a Type I support group, but it hasn’t been earmarked for anything specific yet. Shuttleworth, a member of Troop 549 out of West Milford, said the most difficult part of the project was the fundraising. Originally, Shuttleworth wanted to assemble 500 kits with fewer items but thought fewer kits with more items would better serve the needs of patients. The project received an unexpected boost when a provider from Bridgeport contributed most of the medical supplies that were needed. Haney said she hadn’t discussed the project with Shuttleworth when he was a patient. Shuttleworth said he was inspired by a similar project done by a Boy Scout in New Jersey, “but we thought we could expand on it a little bit,” he said. Along the way, he got guidance and help from his parents, Kellee, a school teacher, and Joe, the Bridgeport Parks and Recreation deputy director. “They just came up with this on their own, and, again we are so appreciative,” Haney said. In turn, the Shuttleworth family is appreciative of the medical care they received, particularly from WVU Medicine. They arrived in Morgantown after a test showed that a primary marker for diabetic ketoacidosis, ketones, was through the roof. Jake Shuttleworth received additional blood work at United Hospital Center before being sent to J.W. Ruby Memorial Hospital. The Diabetes Education Center is a component of the specialized care WVU Medicine offers to diabetic patients. Since Type I diabetes is an auto-immune disease and not hereditary, most patients and families have little experience or knowledge of it. Kellee Shuttleworth said Haney and Carol Ward, a nurse at WVU Medicine Children’s, and Brian Ely, M.D., pediatric endocrinologist, were “so knowledgeable and provided amazing support. “We would not have felt as comfortable with our ‘new normal’ had it not been for the amazing staff at Ruby,” she said. Jake Shuttleworth is still adjusting to his ‘new normal,’ which includes nightly insulin shots – which he administers himself – and a constant vigil on the foods he eats.